Cllr Charles Buchan with PSYV scheme participants Regan Ingram and Daisy Andrews. 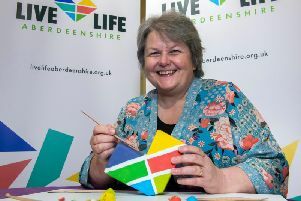 A Fraserburgh councillor has hailed the decision to pilot a Police Scotland national initiative aimed at young people as a tremendous success. Fraserburgh was chosen to pilot the innovative Police Youth Volunteers Scheme (PYVS) to help young people get involved in the community. The scheme sees youth volunteers get involved in everything they can; supporting stewards, helping the elderly, giving out public safety information, lost child wristbands, all while supporting local policing priorities. It has proved very popular, with the volunteers receiving their first year awards at a ceremony held in the town’s Assembly of God Church recently. The awards were made by Police Superintendent Thomson, Divisional Commander for the North-east. The young volunteers, led by PC George Sangster, have been involved in multiple events in the town and surrounding district, including Super Saturdays and the ‘Your Voice, Your Choice’ community event. Commenting on the initiative, local SNP councillor Charles Buchan said: “This has been extremely successful. “Of the original 20 volunteers, mainly from Fraserburgh Academy, 18 have stayed the course, and there has been no shortage of replacements. “The Young Volunteers have put in thousands of hours of community work between them, and I thank them for giving up their leisure time to help others.